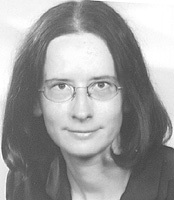 • 2005 Ph.D. in Law at the University of Hanover. Legal Relations of the German Lawyers’ Association (DAV). Reading, hearing, listening and writing about the future of the Internet and of society. I am a German lawyer (Rechtsanwältin) and a member of the »Frankfurt am Main Bar Association. I can represent you inter alia before all German civil courts of first and second instance. I am subject to professional regulation laws, notably the Regulation on the Professional Conduct of Lawyers (Bundesrechtsanwaltsordnung – BRAO), the Code of Conduct of German Lawyers (Berufsordnung für Rechtsanwälte – BORA), the Act on the Calculation of Lawyers’ Fees – (Rechtsanwaltsvergütungsgesetz – RVG), and the Professional Code of Conduct for Lawyers in the European Community. These statutes and statutory instruments, and more, can be found on the website of the »Federal German Bar Association (BRAK). I am also a translator (GER-EN, EN-GER) with special expertise in business English (Wirtschaftsübersetzerin) certified by the »Berlin Chamber of Industry and Commerce.